Diversity training (Jones) was conducted on Tuesday August 1. UWIN students and researchers participated in this enlightening exercise which provided an introduction to diversity concerns and awareness. A webinar will be scheduled for a more comprehensive training in the coming months for those who were unable to attend. External Advisory Committee met on August 2. Final comments and report are currently pending. The third annual UWIN Research Team meeting will focus on project integration, data sharing and test bed integration of project deliverables and outputs. This year will also include a diversity trained aimed at discussing best practices for addressing diversity considerations. An interactive workshop has been designed to facilitate data exchange and establish data sharing protocols. Additionally, affinity group and thrust group meetings have been arranged during lunch to aid in research integration and interdisciplinary interactions. Introduction to the Water Connect App followed by an interactive exercise where researchers will create and share a resource using sample data. No on-site printing is available, bring your posters printed! How can researchers identify beliefs of policy stakeholders through coordination networks in urban water governance? In political science, it has been theorized that actors with similar beliefs coordinate to achieve shared policy goals. These coordination ties form network structures that are critical to the transfer of scientific knowledge. This study uses an exponential random graph model to test how similarity of organizations’ beliefs influence the likelihood their coordination in water-related events and programs. Observations are sampled through content analysis of grey literature on water governance in Tucson. Emily is a 5th year PhD candidate in Public Policy, and minors in Natural Resources at the University of Arizona. Her research examines the belief systems of decision makers and what implications these have for policy outcomes in urban water governance. Urbanization causes increased runoff, flooding, and channel degradation. In some small watersheds concrete channels were constructed to mitigate erosion, leading to increased flow velocities and eliminating natural ecosystem services. Naturalization is a design approach that re-establishes some ecosystem services and reconnects the flow in the channel with the riparian zone. This project focuses on West Branch Herring Run, a small watershed in Towson, Maryland that has been ranked the 9th flashiest stream in the continental United States. The question addressed is whether naturalization of a concrete channel in a residential community is compatible with the goal of reducing flood hazards. We hypothesize that naturalization of the channel will increase frictional resistance, reduce flow velocity and increase flood levels. A 1D/2D hydraulic model will be generated to simulate flood behavior for alternative design scenarios. HEC-RAS software will be used to predict flood inundation extent and water depth and velocity fields. Urban development negatively impacts receiving streams by altering natural flow regimes. While emphasis in stormwater management has been on peak flows, the importance of managing baseflow to reduce negative impacts of development on stream ecology and to control seasonal flow regimes has recently been acknowledged. This project aims to identify how spatial arrangements of stormwater infiltration facilities affect baseflow in timing and magnitude. Previous efforts using lumped modeling approaches have demonstrated the difficulty in predicting baseflow responses to urbanization, due to the inability of these approaches to capture physical processes. To represent the physical characteristics of catchments that drive baseflow response, we use a fully distributed, integrated surface-subsurface finite difference watershed flow model, ParFlow. This work will contribute to recommendations on the most appropriate spatial distributions of infiltration stormwater control facilities. Ben graduated from Colorado State University (CSU) with a B.S. in Environmental Engineering concentrating in Ecological Engineering in May of 2016. While at CSU Ben was an active member with Environmental Engineering Society, acted as Vice-President and then Co-President of the Sustainable Remediation Forum, and engaged in multiple research projects. During the summer after finishing his bachelor’s degree, he worked with the USDA-ARS-Water Management and Systems Research Unit researching deficit irrigation. He is currently working on a M.S. in Civil Engineering in the Hydrologic Science and Engineering program at CSU and expects to finish his program in December of 2018. Urban sprawl over the past decades has caused many professionals to dedicate special attention to impacts of unplanned growth. Water resources are under pressure in urban areas where demand is constantly increasing, quality is impaired and investments are still a struggle in many developing countries. In 2014, the Metropolitan Region of Sao Paulo, Brazil, was the fifth largest urban agglomeration worldwide and was going through the worst drought ever registered in the area. The application of the Integrated Urban Water Model for the study of urban water demand in the municipality of Sao Paulo is pioneering in applying the model outside of the United States and it is extremely relevant in order to offer conservation alternatives and cost saving options. Changes in water demand related to climate change impacts and demographics variation are investigated through future projections to promote a blueprint that can help the water utility and urban planners. Giovana has a bachelor degree in Environmental and Sanitary Engineering and is halfway through her M.Sc. program in Civil Engineering with a concentration in Hydrology and Water Resources at Colorado State University. During her undergraduate program, she was involved in research projects with different focuses, such as greenhouse gases, water quality for irrigation and urban planning. Since 2016, she has been studying urban water demand in the municipality of Sao Paulo, Brazil, through the application of IUWM for the evaluation of conservation strategies and the city’s vulnerability to climate change and population growth. As city landscapes and populations continue to grow, it’s important to understand the energy-rich phase change of liquid water to vapor – specifically within the built environment. Urban canyons trap heat and moisture, and are ideal places to answers questions like, does anthropogenic humidity have a significant effect on thermal comfort and heat stress? Is radiant heat tempered by surface moisture and humidity, and how long does the effect last? We intend to characterize a subset of the water-energy nexus relating to thermal comfort using inexpensive distributed sensors to inform understanding of interactions between dry-bulb temperature, relative humidity and surface temperature in urban areas. Erica is a student at San Diego Mesa College, and recently completed an associate degree in applied mathematics. She will transfer to UC Davis as a hydrology major and looks forward to courses in fluid mechanics and plant-water-soil relationships. A naturalist at heart, she is also interested in environmental engineering as it relates to water quality and sustainability. She recently spent consecutive summers volunteering with water accessibility NGOs in rural Cambodia and India to combine two passions: travel and learning. She is also a yoga teacher and student-athlete, competing year-round in cross country and track and field distance events. The increasing coastal flood risk to assets due to sea level rise is a growing concern for communities throughout the world. As sea level rise, the cumulative annual losses from frequent-not extreme flood events (tidal flooding) may exceed the average annual losses from infrequent-extreme flood events (Storm surge). This study aims to assess the risk to assets from tidal and storm surge flooding in the coastal Southeast Florida under alternative sea level rise scenarios. Our results indicate that, at current sea level, storm surge could generate average annual losses (AAL) larger than tidal flooding, but in response to sea level rise by about 0.5 ft (15.24cm), the cumulative annual losses from tidal flooding will exceed than that from storm surge. The results show a significant exponential increase in AAL from tidal flooding when sea level rise scenarios were included. Thus, it is necessary for policymakers to adopt effective strategies to protect the society from cumulative losses of frequent tidal flooding. Mahshid Ghanbari is a Ph.D. student at Colorado State University. She is from Tehran, the capital of Iran. and started studying Civil Engineering at Iran University of Science and Technology in 2005 and graduated with a B.Sc. degree in 2010. She attended the graduate program at University Putra Malaysia and graduated with a M.Sc. degree in Highway and Transportation Engineering in 2012. After graduation, Mahshid took a rest from academia for a while in order to experience industry. She moved to the U.S. in 2016 and started studying a Ph.D. degree in major of Hydrology and Water Recourses at Colorado State University. Our goal is to understand the influence of governmental fragmentation in the innovation of water management. We use network analysis to test our hypotheses. Liliana is a PhD Student In Public Policy and Management. Her research encompasses urban water management and networks. To better understand the impacts of urban water systems on urban heat islands and the regional climate, this project is dedicated to understand the sensitive and latent heat exchange between the wetted surfaces and vegetated surfaces through thermal sensing. The quantification of the radiant heat exchange between the environment and the human occupants is conventionally done with radiometers of different wavelengths – which is precise but could be expensive and difficult to deploy for continuous measurements in a wide range of urban environments. The presented project is designed to evaluate the feasibility of using modern infrared-sensing technologies to measure the radiant temperature of the surrounding surfaces in a few different urban settings to be compared with radiometers for the discrepancies between the results. A commercially-available FLIR One thermal camera and an academic R&D product S.M.A.R.T. sensor, both with infrared sensing technology loaded despite slight difference in measurable wavelength. Hongshan Guo is a graduate student in the School of Architecture, Princeton University. Her primary research focused mainly on the interrelationship between the built environment and the technology that links the technological interventions related towards the occupants within these environment. Her current research interests lies in understanding the role of energy supply chain’s change by shifting the focus of conditioning for the space to conditioning for comfort – and the technologies that can be devised to support this shift of paradigm. Despite the social and ecological services GSI provides, there are varied degrees of municipal implementation. How can natural scientists investigate and communicate relevant information about green stormwater infrastructure (GSI) to policy makers? How can social science help explain barriers to adoption of GSI across municipalities? 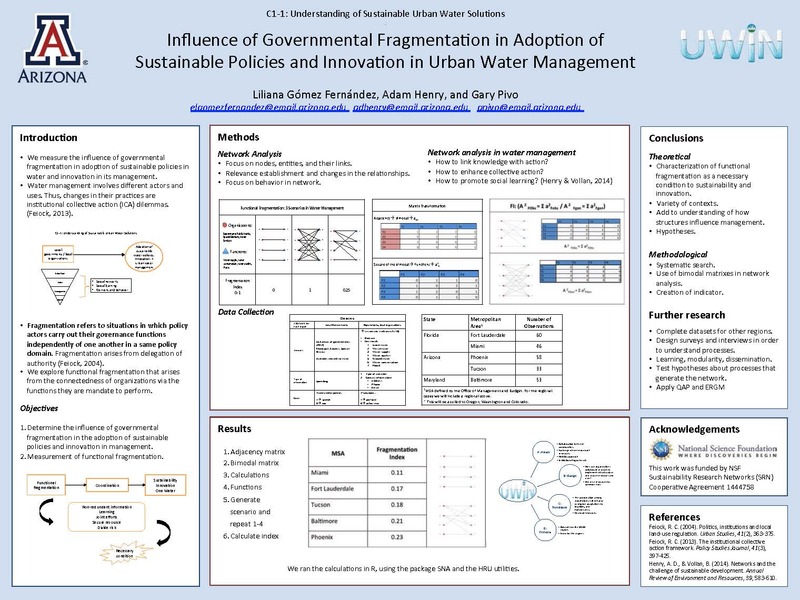 This poster is a collaborative effort between a hydrologist and a social scientist to identify the overlap of disciplines that can be used as a starting point for meaningful discussion between the fields. We discuss how natural scientists can communicate information relevant to the hydrological and ecological functioning of a system or area, and how beliefs of decision makers and policy framing can influence GSI adoption. From this, we present questions for constructive dialogue at this nexus of natural and social science. Neha Gupta is a PhD student working with Dr. Thomas Meixner at the University of Arizona within the Hydrology and Atmospheric Sciences Department. Emily Bell is a PhD candidate working with Dr. Adam Henry in the School of Government and Public Policy at the University of Arizona. Water rates are projected to increase at a rate of 4% within the coming years, this will greatly affect the most vulnerable communities and will also even impact those who can afford the extra expense (Mack and Wrase 2016). Due to the lack of a widely-enforced affordability guidelines or widely adopted economic regulations water rates vary significantly from provider to provider The objective of this research is to look at the specific factors that influence water rates within different providers in South Florida. As well as to assess how these factors shape different rate structures and determine different water rates within South Florida. The specific factors we plan to assess are how the fixed costs and other additional fees providers charge influence the affordability of water. We will do this by comparing the policies of 67 water providers in South Florida. In the end we will have a comprehensive understanding of how these factors contribute to the affordability of water in our study region of South Florida. Marlene is an undergraduate student at Lewis and Clark College in Portland, Oregon. She is an Environmental Studies Major with a specific interest in urban planning and policy making and delving into how issues of inequity come into play with environmental issues. After graduation, Marlene hopes to work with NGOs, community members and policy makers in a collaborative effort to conduct public planning that combines urban resiliency and environmental justice issues. Underground injection controls (UICs) are built to alleviate flooding within the Portland, OR area. UICs impact subsurface flows and have been noted to contribute along with septic systems for 11-12% of recharge within the John Creek Basin. Studies evaluating observed groundwater level data paired with precipitation data suggest an occurrence of flooding may be the control of groundwater in the Johnson Creek Watershed. This study will evaluate historical monitoring data and compare data with the development of UICs to understand how urbanization and the construction of UICs control the hydrologic system. This study will be coupled with a seasonal study of the composition of source waters within the watershed. Geochemical and isotopic tracers will discern groundwaters from imported sources and demonstrate the evolution and mixing of source water flows. The data collected seeks to understand what isotopic and hydrochemical data can tell us about potential hydrologic responses due to UICs. Michael received his BSc in Geology from California State University, Chico and MSc in Environmental Hydrogeology from California State University, Los Angeles. He has conducted research examining geologic and anthropogenic inputs in water quality within urban watersheds and looks to model stormwater systems. His research interests include urban hydrology, hydrogeology, and groundwater-surface water interactions. Population growth and climate change have profound effects on regional vulnerability to water shortage. An analytical framework is presented to assess regional/municipal water shortage vulnerability under nonstationary supply and demand conditions. In particular, changes in drought characteristics are examined to assess vulnerability of the City of Fort Collins Water Supply System to shortage. Changes in water yield in the Cache la Poudre River were evaluated using the Soil and Water Assessment Tool (SWAT) with projected alternative future climates data obtained from the CMIP5 dataset, and downscaled using the Quantile Mapping technique combined with a rigorous temporal downscaling approach. Municipal water demand under alternative climate, population, and water demand management scenarios was estimated using the Integrated Urban Water Demand Model (IUWM). The proposed analytical framework will be used to examine water shortage vulnerability and drought characteristics for cities in the UWIN regions. Hadi is a PhD student and a Graduate Research Assistant in department of Civil and Environmental Engineering at Colorado State University. His concentration is Hydrology and Water Resources, and he joined Dr. Mazdak Arabi’s research group in August 2016. Prior to joining CSU he attended K.N.TOOSI University of Technology (KNTU), one of the most prominent technical universities in Iran. Hadi received both his B.Sc. degree and M.S. degree in Civil and Environmental Engineering with a concentration in Water Engineering. His current research deals with quantifying vulnerability, resiliency, and adaptability of U.S. urban water systems to climatic and socio-economic variability. A concurrent heat wave-power failure event requires alternative cooling strategies to air conditioning. 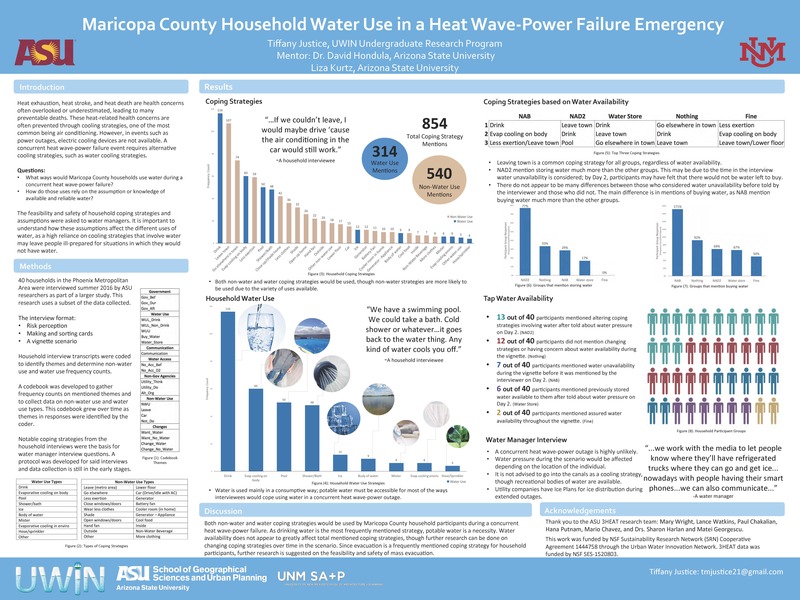 Water cooling strategies were investigated in order to determine how often and in what ways Maricopa county households would use water to cope and to compare possible prioritizations of different uses of water. We investigated the extent to which these prioritizations are based around assumptions of available water and compared them to the knowledge and assumptions of emergency and water managers. The interview data were coded for frequency of themes such as water use strategies and assumed water availability. The results indicated that the participants’ anticipated water uses changed after told by the interviewer that water could be unreliable. We also observed large differences in water use strategies between participants who assumed that water would be reliable versus those who assumed otherwise. Awareness of the possibility of unavailable tap water should be spread to better prepare households. Tiffany Justice is a student at the University of New Mexico working towards a bachelor of arts degree in Environmental Planning and Design and is expected to graduate May 2018. She is interested in current and future designs and usage of the urban form as well as water management infrastructure and citizen and government attitudes towards water. She plans to pursue an urban planning or urban design master’s degree. The purpose of this project is to clarify how adoption decisions are made by exploring the ability of dynamic information acceleration (DII) to model how future adoption decisions might be reached, and their likely outcomes. The data that emerge from DII include not just overall assessments of likely willingness to adopt as a function of experimental manipulations in information content, but also the structure of the information gathering process that leads to that decision. In addition to examining adoption behaviors, the research proposed also addresses another fundamental challenge to making cities more sustainable: how to get individuals and communities to take a long-sighted view and how to encourage long-term planning and investment. Using ChoiceFlow and assessment tools such as surveys and stakeholder interviews, we will study homeowners’ willingness to make investments in residential greywater systems and the different factors that influence willingness to pay across the selected study sites. Timothy Kirby is a PhD student at Florida International University in Environmental Economics and Policy. He received his B.A. in Sustainable Development from Columbia University. There he interned at the UN Sustainable Development Solutions Network (SDSN), focusing on the launch of SDSN Youth, a platform that educates and creates opportunities for young people to use their creativity and knowledge to pioneer innovative solutions for the SDGs. At FIU, his research endeavors include social network analysis of SE Florida climate change professionals and organizations, Social Equity and Environmental Justice (SEEJ) in SE Florida water governance, and water-saving technology adoption decisions. The Automated Geospatial Watershed Assessment (AGWA) Urban tool was developed to provide a Geographic Information System (GIS) based user interface to utilize the modeling capabilities of the KINematic Runoff and EROSion (KINEROS2) model in urban environments. KINEROS2 is a distributed, event-driven, physically based model that provides a modeling element, called the urban element, which can represent each individual lot, with and without green infrastructure practices, in an urban area. The AGWA Urban tool was used to represent and model the hydrology for Bronx watershed in Central Tucson, Arizona. The Bronx Watershed has approximately 680 parcels, comprising of single and multi-family residential lots, as well as commercial lots. LiDAR data from 2015 was utilized to determine the flow path of stormwater on the streets based on elevation. Results were visualized on a lot-by-lot basis for infiltration and runoff volumes, and flow accumulation along the streets. Peak flow hydrograph was visualized at the outlet of the watershed. Yoga Korgaonkar is pursuing a PhD in Watershed Management & Ecohydrology at the University of Arizona. He has a MS degree, also in Watershed Management & Ecohydrology from the University of Arizona. His primary focus is on developing and utilizing Geographic Information System (GIS) based tools to model urban hydrology in order to assess the role of Green Infrastructure (GI) practices in stormwater management, flood mitigation and water supply augmentation. Urban stream restoration efforts are commonly undertaken to combat channel degradation and restore natural stream hydrology. We examine changes in flood patterns along Minebank Run, located in Towson, MD, by comparing post-restoration morphology in 2007 to current conditions in 2017 following damage to the restoration project from persistent flooding. Hydraulic modeling was conducted in HEC-RAS 2D using two alternative scenarios: 2005 LiDAR combined with 2007 surveyed contours representing the immediate post-restoration channel morphology, and a March 2017 DEM created using Structure from Motion (SfM) from high resolution 4K video collected via Unmanned Aerial Vehicle (UAV) flights. Flood hydrographs from a USGS stream gage located within the study reach were simulated through the post-restoration and current modeled terrain and analyzed for changes in inundation extent and velocity fields to assess the net impact on potential flood hazards. Gina received her B.S. degree in Geology in in 2003 from UC Davis, an M.S. 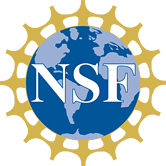 degree in Applied Geosciences from San Francisco State in 2008, and has completed the first year of a Ph.D. program in the Department of Geography and Environmental Systems at UMBC. Her research interests have been in the field of fluvial and tectonic geomorphology and novel remote sensing techniques. She has over 7 years of experience working as a Staff Geologist in the environmental consulting field and is a registered Professional Geologist in the state of California. To maintain urban forests in semiarid cities, rainwater harvesting has been widely adopted as a sustainable and effective method of tree irrigation. However, the effects of disparate irrigation techniques – passive versus active – may differentially impact microclimate and ecosystem services. Here, we compare ecohydrologic responses to passive and active irrigation systems by measuring soil moisture, transpiration, temperature, and canopy phenology at two urban sites in Tucson, AZ. We hypothesize that trees in actively irrigated systems will exhibit higher rates of productivity compared to passively irrigated trees, and thus produce more ecosystem services for a longer period throughout the year. Preliminary results suggest differences in canopy greening and microclimate between the two irrigation techniques. This research can help to improve understanding of the practices and function of green infrastructure in semi-arid cities and inform models that attempt to aggregate the influence of these urban forests for understanding watersheds. 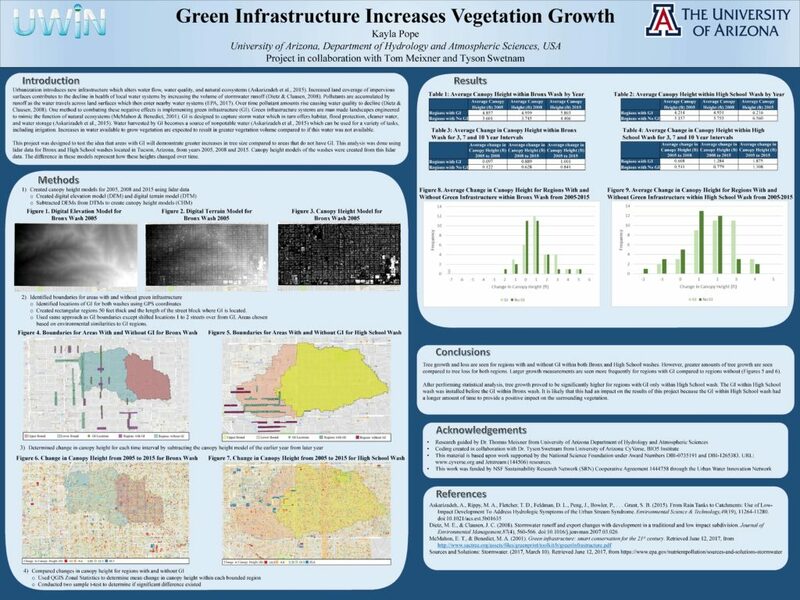 Anthony is a Masters Student in the Watershed Management Program of the School of Natural Resources and the Environment at the University of Arizona. His undergraduate degree is in Conservation Biology, but after an internship in his senior year with the Watershed Management Group NGO in Tucson, Arizona Anthony became interested in green infrastructure. Water crisis is one of the greatest sustainability challenges of the 21st century. In semi-arid regions, the growing gap between diminishing water supply and increasing water demands from municipal, agricultural, industrial, and environmental uses poses risks to reliability of regional water supply systems. Dipsa is a strategy game being developed at Colorado State University to enable gamers playing the role of stakeholders to identify solutions for meeting multiple and often conflicting water management objectives. In order to nudge players toward environmentally effective, socially, viable, and economically feasible solutions, user-friendly visualization of the effects of management decisions is vital. Extensive research was conducted to identify which multi-objective visualization techniques that are commonly used in published literature or similar games. A set of recommendations were provided for selection of appropriate visualization techniques for various components of Dipsa. Krzysztof is a mechanical engineering senior at The City College of New York. His mentors are Andre Dozier and Mazdak Arabi at Colorado State University. He aspires to improve the efficiency and reliability of water-saving technologies. Municipal water demands exhibit seasonal patterns in response to withdrawals for landscape irrigation, particularly in arid and semi-arid regions. Previous studies estimate outdoor water use through utility billing records, remote sensing, and mass balance approaches. These studies have typically been implemented on small spatial scales, primarily for individual municipalities, due to difficulty acquiring billing records and involved data processing required for remote sensing imagery. This study aims to assess the correlation between outdoor water use and climatically-driven factors (i.e. precipitation, temperature) using monthly water deliveries compiled for 232 cities by Brown, T., R. Foti, and J. Ramirez (2013), Projected freshwater withdrawals in the U.S. under a changing climate, Water Resour. Res., 49. The portion of outdoor use is derived from the assumption that winter deliveries are a proxy for indoor use. Results of this study have implications for water resource planning, hydrologic considerations, and utility pricing. Nicole is currently working towards her M.S. 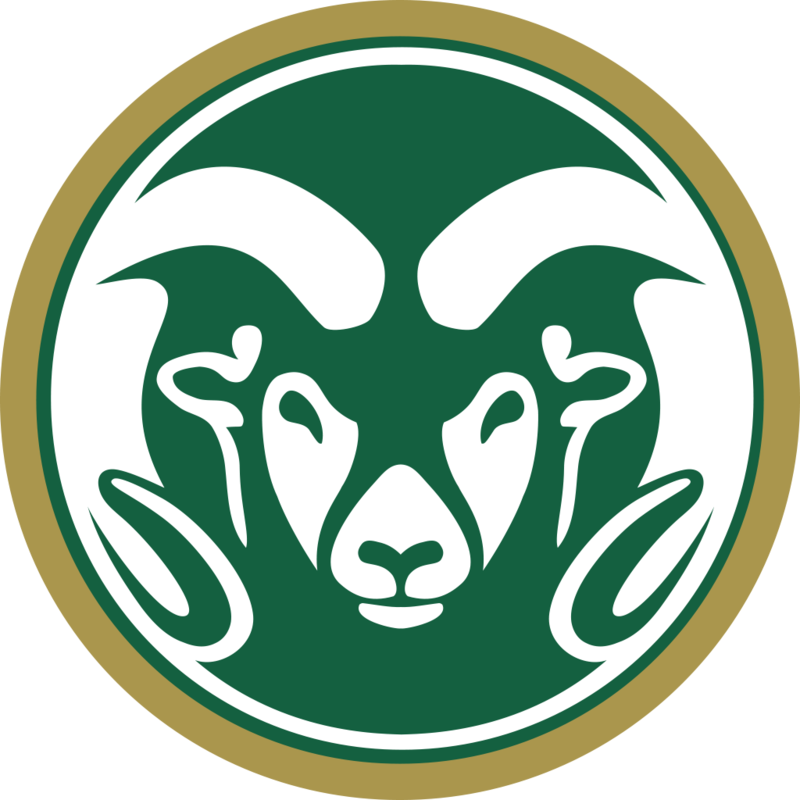 in Civil and Environmental Engineering at Colorado State University, with a focus in engineering science and hydrology. She chose this program for its ample opportunities in water-related research, and its ideal location in close proximity to the mountains. She recently graduated from Penn State with a B.S. in Biological Engineering, where she discovered her passion for addressing water resource issues. She loves to travel and hopes upon graduation to work for a company with global opportunities to address water resource challenges in diverse environments. For years, residents of Chelsea, Massachusetts have witnessed the degradation of their city’s waterfronts. Chelsea’s low land value, its location near the airport, and the National Pollutant Discharge Elimination System (NPDES) permits issued by the Environmental Protection Agency (EPA) have allowed industries to discharge polluted wastewater into the Mystic River. Environmental justice research has shown that predominantly immigrant and low-income communities like Chelsea are targeted by corporations because they lack knowledge of and involvement in EPA’s permitting process. I collected data using interviews, participant observation, and ethnography from high school students to examine how their attitudes and behaviors toward pollution changed as they learn new knowledge about NPDES permits and use simple sensor-based technology to measure discharges in the river. My results highlight the effects of how relaying findings from my research back into the community can motivate students to become autonomous agents of community change. Growing up in Chicago’s west side always left a mark on the ideas and paths that David would pursue. After attending Lincoln Park High School, David received his associates degree at Wilbur Wright College. He knew after graduating at Wilbur Wright that he wanted to attend a liberal arts institution which led him to studying Environmental Justice at Beloit College. Throughout his time at Beloit College, he has conducted his own research on topics involving environmental racism in the wilderness of Minnesota. He intends to graduate from Beloit College by December 2017 and aspires to find a career in Environmental Management, Politics, or move on to graduate school. Urbanization alters the hydrologic and ecological processes affecting vegetation in cities. Green infrastructure is implemented to counteract the effects of urbanization. This mitigation is accomplished by capturing storm water that in turn offers habitat, flood protection, cleaner water, and water storage. Increased water availability should enable vegetation to grow more abundantly. The purpose of this project was to provide evidence that the presence of green infrastructure will facilitate increased vegetation growth. Our metrics of growth included greater volume of vegetation compared to areas where green infrastructure is not present. This investigation was conducted using lidar data of urban areas in Pima County, Arizona, from 2005, 2008 and 2015. Differentials in tree size were calculated to represent tree growth or loss. Distribution of these differentials were compared to green infrastructure placement to determine whether there was a significant difference in growth for presence and absence of green infrastructure. Kayla Pope is a 21-year-old student from Pasadena, Maryland. She attended Anne Arundel Community College before transferring to University of Maryland Baltimore County in the fall of 2015. She is now a rising senior at the university majoring in chemical engineering with a track in environmental. She plans to earn a master’s degree in environmental engineering. She is particularly interested in water quality and hopes to pursue a career within this field after college. She would like to one day contribute to the efforts being made in restoring the Chesapeake Bay. Green infrastructure (GI) is increasingly being used by cities to mitigate stormwater-related flooding and runoff pollution. Many GI systems currently being implemented (eg. bioswales, green roofs) are uncontained and passive in their design. Research has shown that the effectiveness of these systems for stormwater interception and pollutant removal can be variable. A contained hybrid GI design, recently developed, allows for “activation” of the system to control water retention and soil conditions. Mesocosm experiments were conducted to compare the performance of passive and active GI systems over a range of simulated stormwater runoff events. Historic precipitation data (Aug – Sep 2011) and trends from Red Hook, Brooklyn were used to design the experimental events. Mesocosms were monitored for water output volumes and nutrient removal. Results from this experiment will inform the optimized design and implementation of GI in urban areas, such as New York City. Ashley Rolon-Marlowe is an undergraduate student in the Environmental Studies-Environmental Earth Science program at Hunter College (City University of New York), where she previously earned a bachelor’s degree in English and Adolescent Education. She was an intern with the Prospect Park Natural Resources Crew and volunteer at the Brooklyn Botanic Garden. Her interests include environmental justice, water quality and conservation, and science and sustainability education. Although a native New Yorker she spends her free time exploring new parts of the city by bicycle and taking city-nature photos. Low-income and racial/ethnic minority communities have historically been and continue to be disproportionately burdened by a host of water-related problems (e.g. affordability, demand, governance, infrastructure, quality, and supply). To ensure that UWIN can address such inequities in designing sustainable water solutions, the Social Equity and Environmental Justice (SEEJ) team seeks to gain insights from community perspectives by conducting interviews with leaders of community organizations on urban water pressures and problems. To date, interview participants from the Detroit, MI region have represented various types of organizations – ranging from faith-based, to local grassroots, as well as local chapters of national non-profit organizations. These participants have discussed water issues affecting residents such as water privatization, affordability and shutoffs, contamination, and aging infrastructure. This poster presentation will highlight the preliminary results from a content analysis of these Detroit-based interviews. Mariana Sarango is a student in the Population Health PhD Program at Northeastern University. She holds a BA in Sociology from Wesleyan University and a MPH in Sociomedical Sciences from Columbia University. Her research interests focus on the impacts of physical infrastructure and relevant policy on health of communities and on health inequities. Her past research includes evaluation of perceived water quality among public housing residents, health impact assessment of proposed infrastructure development, and examination of home health hazards among marginalized elderly residents. She currently works with Dr. Sharon Harlan on the Social Equity and Environmental Justice (SEEJ) UWIN team. This presentation outlines the efforts and preliminary results of an extended research visit to the University of Arizona and the Sun Corridor for integrative model coupling in which hydrologic and hydraulic models (Kineros-Opus 2 and HEC-RAS 5.0.3, respectively) are simultaneously developed and then linked. Ultimately, model results will be incorporated into floodplain mapping efforts that assess the efficacy of various mitigation strategies to enhance flood resilience while providing multiple co-benefits. Flow data supplied to hydraulic models at discrete nodes within the drainage network will be the product of cumulative hydroclimatic processes realized throughout the watershed by hydrologic model simulations. Consequently, there is a direct connection between hydrologic model results and hydraulic modeling inputs. The arid climate and physiography of the Sun Corridor impose unique conditions on model adjustments, sensitivity, and uncertainty that must be considered when interfacing realizations and interpreting the results. Tim Stephens is a civil engineer with extensive experience in hydraulic modelling and stream restoration. He earned a Bachelor’s of Science in Civil Engineering from the University of Tennessee, a Master’s of Science in Civil Engineering from Colorado State University, and is currently a PhD student in the College of Engineering at the University of Georgia. Over 50% of the world’s population lives in urban areas and scholarship into urban-ecological interactions is growing for many parts of the world. This scholarship, however, is heterogeneous, with some regions receiving considerably greater attention than others. We present two studies utilizing Google Earth Engine (GEE), a powerful online cloud-based geospatial storage and parallel-computing platform. The first is a data-driven definition of global built-up areas based on Landsat 5, 7 & 8 imagery and ancillary data sets, with illustrative examples of improved classification accuracy drawn from a trio of geographically diverse countries. The second quantifies the potential yield and ecosystem services of urban agriculture, also at global scale. These studies have applications to energy demand, water stress, human health, food security, urban-ecological interactions, as well as for the development of adaptation and mitigation strategies to offset local and large-scale climate change. Michelle is a geography PhD student who may or may not be purposefully trying to live in every region of the country. Hailing from the Midwest, heading east for a bachelor’s degree at George Washington University, she is now at Arizona State University. Her current research working to map built-up land cover globally has driven home something she’s learned in her travels…cities across the United States and around the world look very different from each other. When not developing algorithms to account for global variation in urban footprints, Michelle investigates the effect of policy on land cover/use change. This work explores development of a fully coupled atmospheric, land surface, and groundwater model for application to urban areas. Previous attempts for modeling urban atmospheric and hydrological processes have been done in a disconnected style, where either subsurface-land surface processes or atmosphere-land surface processes have been represented. However, due to disconnection between groundwater and the atmosphere in these models, some urban processes are underrepresented or not represented at all. We seek to couple two existing subsurface-land surface (ParFlow.CLM) and land surface-atmosphere (WRF.PUCM) models to address this deficiency. 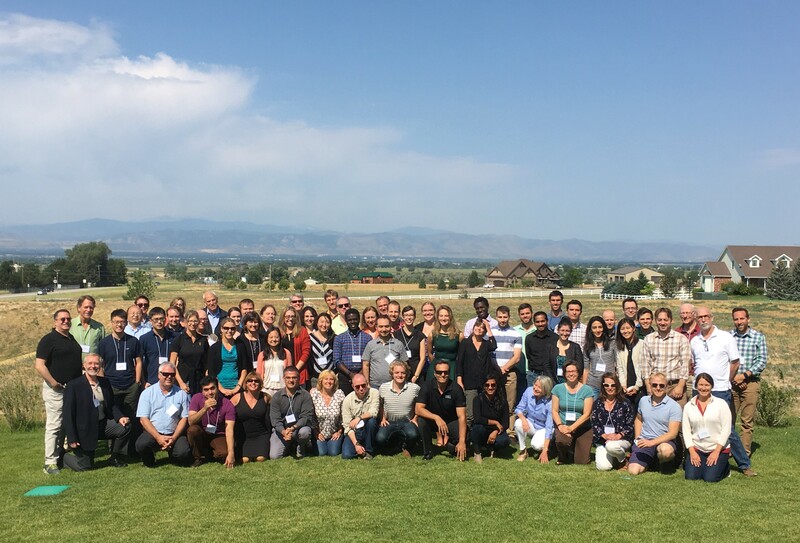 Our goal is to evaluate subsurface-atmosphere interactions for UWIN cities where groundwater-atmosphere exchange is expected to be important (Baltimore, Denver, Portland). We are first focusing on methods development with application to the Baltimore- Washington metropolitan area. Born and raised in Iran, Mahdad Talebpour is a PhD student in Environmental Engineering at University of Maryland, Baltimore County (UMBC). His research focuses on investigating subsurface-atmosphere interactions in urban areas. He holds a master’s degree in Civil Engineering from Penn State University and a BSc in Civil Engineering from Persian Gulf University in Iran. During his undergraduate studies he served as an intern in Setavin Building & Designing Company. He then, continued to work there for a year as a Project Engineer, before coming to US to continue his graduate studies. He currently lives in Baltimore, MD. The overall health of individuals residing in urban areas is influenced by local air temperatures. Therefore, urban planners are considering on expanding areas of vegetation primarily for microclimate cooling. However, the impact of cooling caused by an increase in vegetation in urban climates is still not certain. Which leads us to this question: how do different types of vegetation transitions interact and influence microscale air temperature (Ta) patterns? Our research analysis of air temperature variations will be obtained by a network of 30 Ta sensors (iButtons) placed in six different plots around the University of California Riverside campus during the summer of 2017. These sensors will be placed at a height of 1.5 m for all locations and the plots vary from transitions of highly vegetated areas to asphalt surfaces. Data retrieved from these sensors will be collected within the 3rd -17th of July. We expect to see from our analysis a lower Ta on highly vegetated areas and higher temperature on asphalt surfaces. Miguel Valencia is a current resident of Miami, FL. but originally from Colombia and arrived to this country at the age of 19. In 2016, he received his A.A degree with a pathway in Geology from Miami Dade College where he was an active member of many clubs and honor societies and also made it to the Dean’s list. While at Miami Dade College Miguel participated in and carried out his first Independent Research based on Sea Urchins. He is currently working towards his Bachelor’s Degree in Geoscience at Florida International University. Miguel has obtained certifications on DBHYDRO database-training (2016) and Earth-Imagery-at-Work from UDEMY (2017). The use of shade trees has been recognized as an effective intervention in mitigating excessive thermal stress and energy consumption for cooling during summer time. 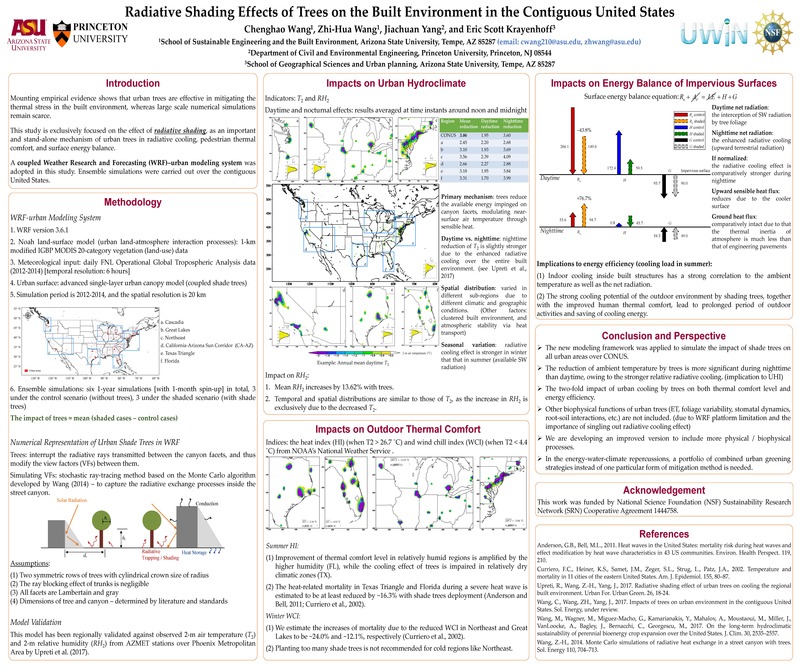 We evaluated the effects of shade trees on the built environment in terms of radiative cooling, pedestrian thermal comfort, and surface energy balance. A coupled WRF – advanced single-layer urban canopy modeling framework was adopted and applied to the contiguous United States (CONUS). Results show that on average the mean 2-m air temperature in urban areas decreases by 3.06 ˚C, and the 2-m relative humidity increases by 13.62% over the entire CONUS with tree shading. Shade trees help to improve summer thermal comfort level, but could be detrimental in the winter for Northern cities. The energy balance of impervious surfaces indicates that trees primarily enhance the radiative cooling, leading to significant re-distribution of the sensible heat exchange, but comparatively insignificant impact on the ground heat flux. Chenghao Wang is a Ph.D. student and a graduate research associate in the School of Sustainable Engineering and the Built Environment at Arizona State University (ASU). He obtained his bachelor’s degree in Hydrology and Water Resources Engineering at China Three Gorges University. He has been intensively involved in UWIN Project A2-1 (land-atmosphere-hydrosphere interactions in urban terrain) for 2 years. His research mainly focuses on modeling the impact of urban trees with WRF model, stochastic modeling of urban atmospheric diffusion, and urban sustainability. Increased frequency and magnitude of extreme climatic events have raised the risk of infrastructure to flood damages. Hydraulic structure design generally assumes stationarity in extreme events, or that their frequencies will remain constant. This assumption is no longer applicable under the changing climate regimes and nonstationarity of flood events must be recognized. This study aims to quantify the changes in flood magnitudes and frequencies across the United States under a reanalysis of peak flow gage records over the course of the last 60 years using a moving 30-year analysis window. These results in changes in flood frequency were then analyzed spatially to evaluate underlying spatial patterns to changes in flooding risk. Tyler holds a B.S. and M.S. in Civil Engineering from CSU and is a project manager and the principal developer for numerous tool sets including the CLEAN Nutrient Dashboard, Comprehensive Flow Analysis (CFA), Watershed Rapid Assessment Project (WRAP) and other water resource related tools deployed to the eRAMS platform. Recently he has started work on a PhD at CSU in Civil and Environmental Engineering focusing on flood frequency analysis. He is also the chief adviser for the student chapter of Tau Beta Pi, The Engineering Honor Society. 30: CAN REGIONAL WATER DEMAND REDUCTION STRATEGIES SAVE LAND IN AGRICULTURE IN SEMI-ARID REGIONS? Regional water demand reductions provide semi-arid regions under water scarcity with solutions to sustain agriculture and mitigate the effects of population and urbanization on rural water transfers. The South Platte River Basin in Colorado is one of the fastest growing regions in the U.S. The river basin encompasses large agricultural and urban sectors, rapid population growth, climate variability, and complex water rights institutions. These factors in combination change water demand and supply, hence influencing the regional vulnerability to water shortage and encouraging agriculture-to-urban water transfers. The purpose of this study is to investigate the effects of water demand reduction strategies on the economic viability of rural areas. Results indicate conservation strategies can sustain agricultural production, reduce municipal costs of water acquisition, and decrease the effects of urbanization on rural economies. Ben Wostoupal is a M.S. Student in Civil & Environmental Engineering at Colorado State University and investigates research in water supply planning and management. Ben received his B.S. in from Iowa State University with degrees in environmental science and economics, specializing in hydrology. He is currently researching the effects of rural and urban conservation, climate change, and policy institutions on the future of agriculture and water supply in the South Platte River Basin. With specialties in economics, modeling, and water supply planning Ben plans to focus further research water transfer interactions. We are characterizing intra-city variations in environmental variables that influence human thermal comfort. As part of the UWIN Network of Networks project, we deployed 100 temperature sensors across the Phoenix Metropolitan Area. Sensors are recording data at 10 minute intervals throughout the months of June, July, and August of 2017, and captured a record-setting heat event in Phoenix in early summer. This poster shows the distribution of sites by landscape characteristics, such as NDVI, and describes stakeholder engagement for site selection. We performed a more detailed investigation of landscape radiative properties at select sites using infrared and globe thermometry. We measured high variations in thermal comfort at sites characterized by similar air temperature and relative humidity. Mitigation of heat to achieve public goals related to well-being and productivity demands attention to variables less frequently discussed in heat action plans and policies. Mary Wright is a Ph.D. student at Arizona State University studying urban climates and human biometeorology, especially in relationship to extreme heat and thermal comfort. Her main research interests focus on characterizing the indoor thermal environment in the context of heat-related morbidity and mortality that occurs due to indoor heat exposure. What would happen to our way of life if climate change caused sea levels to rise in ways that affected access to drinking water? Can science even address this question? We have models of natural systems and models of water infrastructure systems, but we don’t have models of how these systems will interact as local governments adapt to climate change. Our plan is to model southeast Florida municipalities interacting as they adapt to saltwater intrusion into their water supply. We’ll use available literature to design an agent-based model, then use the AnyLogic modeling platform to build the model. We’ll then incorporate several long term sea-level-rise scenarios and experiment with a variety of municipal response strategies. We hope to be able to observe whether different local or regional strategies (from a management theory, game theory, or network theory perspective) result in better or worse local or regional outcomes. Water supply and demand assessment under alternative climate, land use and population scenarios is an area of great interest amongst urban planners and water managers. The Integrated Urban Water Model (IUWM) has been developed and demonstrated for forecasting urban water demand with options to assess effects of water conservation and reuse, climate change, population growth, and land use change. The performance validity of the model predictions was evaluated against observed monthly water use data over the 2000-2014 period for the City of Fort Collins, CO. IUWM was shown to provide very good estimates of indoor, outdoor, and total demands for each individual block group as well as the entire municipal area. The calibrated model was then used to evaluate water conservation and reuse scenarios as well as scenarios of urban growth and climate change. The HSPIS is a survey of residents in nine major metropolitan areas of the United States designed to address questions about the socio-spatial distribution of the public’s attitudes and behaviors related to water. The survey uses scenario-based questions to determine how water pricing policies affect people over the entire socio-economic spectrum and how people perceive water-related pressure points, risks, and benefits with respect to their health, safety, and livelihoods. Sample boundaries are drawn to include one large city and at least one smaller city located within a HUC-8 watershed. Zip codes, stratified by race and income to ensure representation of minority and low-income households, are the primary units from which samples of households are drawn. This presentation displays maps and attributes of the sample areas. The HSPIS is potentially of interest to all UWN projects. To view contents of the survey or take the survey (encouraged), email s.harlan@northeastern.edu. Extreme heat is among the leading causes of weather-related mortality and morbidity in the United States. Reducing the incidence of heat-related deaths and illnesses is often cited as motivation for urban heat mitigation strategies. Despite the intuitive claim that urban residents are at higher risk of these health events because of higher temperatures in cities, the literature demonstrating such an association is quite limited. We paired daily heat-related death counts from the Maricopa County (AZ) Department of Public Health heat surveillance program with weather data collected at a regional network of monitoring sites operated by the Maricopa County Air Quality Department. We estimated the association of the temperature-mortality association using conventional methods and subsequently added terms to the model representing the intensity of intra-urban temperature contrasts. Some models suggested a significant link between urban heat intensity and heat-related deaths, but results were highly sensitive to parameter choice. Urban climates are projected to warm over the 21st century due to global climate change and urban development. To assess this projected warming, Weather Research and Forecasting model simulations are performed at 20 km resolution over the contiguous U.S. for three 10-year periods: contemporary (2000-2009), mid-century (2050-2059), and end-of-century (2090-2099). Urban land use projections are derived from the EPA’s ICLUS data set, and future climate projections are based on two global climate models and two greenhouse gas emissions scenarios. The potential for design implementations such as ‘green’ roofs and high albedo roofs to offset the projected warming is considered. Effects of urban expansion, urban densification and infrastructure adaptation on urban climate are compared over the century. Assessment considers impacts at both seasonal and diurnal scales, isolates fair weather impacts, and considers multiple climate variables: air temperature, precipitation, humidity, and wind speed. Many water practitioners and researchers have expressed a desire to use integrated water management strategies to transition to more sustainable water practices. While such goals are frequently discussed, legacy infrastructure and institutional silos have created numerous barriers to integrated management. In particular, financial barriers and limitations were identified through stakeholder meetings and engagement. Using a survey of financial officers and utilities managers, this research identifies specific ways in which integrated management and co-funding of water infrastructure and practices is prevented by current institutional and legal frameworks. It also references case studies to highlight common themes and practices observed across urban water service providers and suggests ways in which some of these barriers can be overcome. The Sky View Factor (SVF) is a 2D representation of urban form and an important concept in urban climatology for analyzing the impact of urban morphology on climatological processes. We introduce a method to automatically calculate SVFs at street level from Google Street View (GSV) imagery using WebGL and Node.JS. First, we retrieve images at 90° field of view for all GSV locations in a city of interest. Then, we generate hemispherical fisheye views through equiangular projection, automatically detect sky regions in the resulting fisheyes using a modified Sobel filter, and calculate the amount of visible sky on the hemisphere. We present SVF maps for 13 cities around the world, along with histograms to illustrate the SVF footprint of each city, to show inter- and intra-city variability of urban morphology. Our high-resolution SVFs can be used as urban canopy parameter in atmospheric models, radiation schemes, and thermal comfort models. Many water agencies are looking to demand-side solutions to combat with water scarcity. Installing water-efficient technology into households comes with it an additional cost and motivation, creating a gap between the overall potential households that could adopt this technology, and how many actually adopt. The objective of this study was to examine the behavior of households regarding the installation of water conservation technologies and evaluate strategies that could potentially increase water conservation technology adoption. This study created an agent-based modeling simulation that captures various demographic characteristics, household attributes, social networks, and water policies; and then evaluates their influence simultaneously on household adoption decision. The application of the proposed model was demonstrated using a case study of households in the City of Miami Beach. The simulation results enabled evaluating significance of various factors in household water conservation technology adoption, and exploring scenarios. Kambiz Rasoulkhani is a second-year Ph.D. student in Civil Engineering at Texas A&M University. His research area focuses on sustainable and resilient infrastructure and complex systems modeling. Kambiz holds a Bachelor degree in Civil Engineering from Sharif University of Technology (Iran). During his undergraduate studies, he participated in multiple research studies and was a teaching assistant in various construction engineering courses. He joined the I-SoS research group in Spring 2016 as a research assistant and started his research by working on UWIN thrust B1 project which is the assessment of urban water infrastructure resilience. Future planning for urban water systems will require the ability to imagine, design, and model system response to changes in population, climate, and management at multiple scales. A multi-scale approach is required to accurately represent regional pressures and trends that influence boundary conditions for urban areas, as well as the performance of water systems within the city. At all scales, there is a need to include not only conventional practices and infrastructure, but the capability to represent innovative water management options and infrastructure. We have developed and implemented a whole watershed model (OUWIN), which simulates the water systems in the Portland urban area within the context of the Willamette River basin. OUWIN supports sub-models operating at annual, daily, hourly, and sub-hourly time steps, and at spatial scales ranging from whole tributary watersheds down to urban census blocks. Examples are presented for two alternative future scenarios (Current Course and Stressed Resources). New York City is an ultra-urban area, with combined sewers and buried stream channels. Traditional flood studies rely on the presence of stream gages to detect flood stage and discharge, but ultra-urban regions frequently lack the surface stream channels and gages necessary for this approach. In this study, we aggregate multiple non-traditional data for detecting flash flood events. These data include phone call reports and city records. The data are compared with high-resolution bias-corrected radar rainfall fields to study flood events in NYC. We seek to determine if these non-traditional data will allow for a comprehensive study of rainfall-runoff relationship in NYC and to compare spatial distributions of rainfall and flooding within the city. Current research efforts seek to better understand the interactions between flood flows and urban channels, floodplains and riparian zones as influenced by urban infrastructure and efforts to mitigate impacts of urban development, green infrastructure (GI), low impact development (LID), and sustainable urban drainage systems (SUDS) on flood response and other environmental consequences. Floodplain mapping assisted by modeling of flood hydraulics will represent baseline, development, and various conservation scenarios to examine how integrated GI, LID, and SUDS can be strategically designed and positioned to simultaneously enhance flood resilience while providing multiple co-benefits. The resulting floodplain inundation maps will be probabilistic and reflect uncertainty quantified through Monte Carlo analysis of model inputs and parameters, competing methods of linking precipitation and land use scenarios to generate flood frequency distributions, and innovative techniques for portraying channel morphodynamics and erosion hazards. Water and energy systems are intricately connected. Both will experience the effects of- and have an effect on- climate change. Understanding the factors that affect energy consumption, greenhouse gas emissions, and other environmental implications over the lifecycle of urban water systems facing a variety of challenges will be key to a resilient, sustainable future for the industry. To develop this understanding, we plan to apply life-cycle assessment (LCA), a methodology created to quantitatively track the environmental implications of resource inputs and material outputs from a product, process or system, to water systems in the case study cities, evaluating the tradeoffs associated with selecting alternative water sources, changing critical operational parameters, implementing innovative technologies, and determining effective scales for implementation, for example. We will present the goals, approach, and key questions as well as describe the current status of applying LCA to urban water in UWIN cities. Using watershed models for quantifying nonpoint source pollution loads and estimating the effectiveness of related conservation practices (BMPs) introduces modeling uncertainties when developing water quality trading programs. Currently, “trading ratios” are used within nutrient trading programs to account for natural variability of nonpoint source loads. However, uncertainties due to application of models are overlooked. A Bayesian total uncertainty assessment framework is presented to assess the effectiveness of the watershed management practices in reducing nonpoint source water pollutants. The framework entails a two-stage procedure. First, various sources of modeling uncertainties are characterized during the period before implementing Best Management Practices (BMPs). Second, the effectiveness of the BMPs are probabilistically quantified during the post-BMP period. The framework is then used for quantifying trading ratios for a nutrient trading program in Jordan Lake Watershed in North Carolina. Many studies have found that open water bodies influence the microclimate of urban areas through evaporative cooling and the support of greenspace. A recent restoration of the Cheonggye stream in the center of Seoul, South Korea provides an opportunity to study such effects. Mobile microclimate measurements were obtained along transect routes directly adjacent to the stream and extending into the city. An average difference of 16.9Wm-2 and 0.9°C in thermal comfort (TC) and wet-bulb globe temperature index respectively, were found between the lower and upper transects. The environment consisting of full sun with vegetation had the highest average Ta (33.1°C), lowest TC, and highest WBGT, with bridge shade providing the greatest comfort. Overall, the stream had a minimal effect on urban heat mitigation, with shade improving TC more than the presence of open water with vegetation. Quantifying these exposures at the human scale generates new evidence to guide climate adaptation in large cities. SHOULD CITIES EMBRACE THEIR HEAT ISLANDS AS SHIELDS FROM EXTREME COLD? Extensive studies focusing on urban heat island (UHI) during hot periods create a perception that UHIs are invariably hazardous to human health and the sustainability of cities. However, the health risk associated with cold weather excursions is in fact higher than for hot ones, yet the dynamics and potential benefits of wintertime UHI have hardly been explored. We combine ground-based observations from 12 U.S. cities and high-resolution weather simulations to show that UHIs intensify during cold waves relative to precedent and subsequent periods. Heat release from urban man-made materials enhances the night-time UHI by 1.32 ± 0.78 oC (mean ± standard deviation), significantly reducing the cold waves’s risks. More importantly, standard UHI mitigation measures reduce these cold time amenities to different extents. The vastly under-recognized benefits of UHIs as shelters against extreme colds should be cautiously revisited in urban planning and policy, particularly in cold and cool temperate climates. Do NOT email any portion of your request – please mail all original receipts, print electronic receipts and your completed forms in one packet. To expedite your reimbursements, please submit your documents within 14 days of travel. Any documents submitted outside the designated time frame will not be processed until our schedule allows and may result in delayed payment. CSU Travel Services will ONLY reimburse lodging with an original folio from the hotel showing payment and balance $0. For airline tickets purchased online, CSU Travel Services requires the entire email confirmation showing itinerary and payment section. Photo copies of receipts are NOT acceptable. Scans of receipts attached to emails are NOT acceptable. Receipts are not required for reimbursements of $25 or less on taxi, shuttle, parking and baggage fees. Do not tape, highlight or use staples on any receipts. Please do not print electronic receipts double sided (all receipts are scanned by CSU upon arrival).